The United Nations Climate Change Conference (COP15), which was held in Copenhagen from December 7 to 18, was a huge disappointment for millions of people who hoped a fair and binding treaty aiming to reduce global greenhouse gas emissions would be reached to succeed the flawed Kyoto Protocol. Instead, world leaders produced a non-binding accord, and failed to agree to contain global temperatures at 1.5 degree Celsius above pre-industrial levels. This means world leaders did not agree to limit the global CO2 emissions to 350 parts per million. The Maldives, which hosted a number of events coinciding with the International Day of Climate Action on October 24, including a headline-grabbing underwater cabinet meeting, has gained nothing to celebrate from COP15. You’ll likely hear the Copenhagen drama spun in a thousand different ways, but here’s our honest take on the outcome: our leaders have been a disappointment, and the talks have ended without any kind of fair, ambitious, or legally binding global agreement. It’s unclear whether the weak “accord” which emerged early this morning will provide a platform strong enough to deliver the kind of action we’ll need in 2010 and beyond. Despite overwhelming scientific evidence, and massive popular support from citizens in countries North and South, world leaders chose national political self-interest over the fate of future generations and failed to resolve the issues blocking the road towards a just outcome. Not fair, not ambitious and not legally binding. The job of world leaders is not done. Today they failed to avert catastrophic climate change. The city of Copenhagen is a climate crime scene tonight, with the guilty men and women fleeing to the airport in shame. World leaders had a once in a generation chance to change the world for good, to avert catastrophic climate change. In the end they produced a poor deal full of loopholes big enough to fly Air Force One through. We have seen a year of crises, but today it is clear that the biggest one facing humanity is a leadership crisis. In Copenhagen, leaders didn’t make history—but the world’s people did. A year of unprecedented action on climate change reached unimagined heights in the last two weeks: thousands upon thousands of vigils, rallies, and protests; floods of phone calls and messages sent; millions of petition signatures—all calling for the fair, ambitious, and binding climate treaty we still need and still will win. All movements need to come together as ONE with a universal goal. a common goal that is to take care of earth and its earthlings (which is the only habitable place in universe know to man so far) and intelligently manage the resources of the planet among all the people equally. How can we say it is a failure when we do not understand the problem itself to henceforth find a solution??? Did not Mr.Nasheed get enough international attention and support to carry his word through the ranks of world leaders in future correspondences…is that not a victory? Did not the international media cover the 350 campaign and the environmental NGO’s at work much greater than it ever has before? Did not the COP15 become a household name in small island nations as well during the months? Did not the developed nations promise millions of dollars for the developing nations to adapt to changes in climate? Did not Maldives name a great country like China in asking for support at a international stage? So i wonder how we can say it was a total failiur…im just curious…is this nto a victory in a way…we won some battles…maybe we lost the war…but we live to fight another day…is that not a good thign? will we not have more leverage in the next round? Do we not have enough media and support from private sector to call for another meeting prior to the next COP and beg and ask for the developed nations for greater local commitments??? The Copenhagen accord took “Note” (no agreement) of concerned of member states and set far of any short of any real commitment and substance. 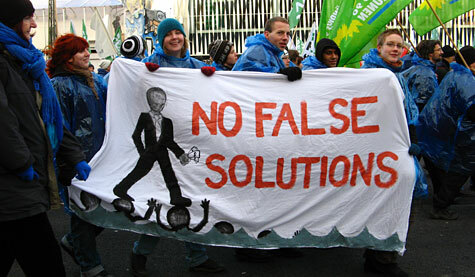 The negotiations in Copenhagen ended without a fair, ambitious or legally binding treaty to reduce greenhouse gas emissions. The Accord set a goal of limiting global warming to a maximum 2 degrees Celsius and 450 ppm over pre-industrial times. But it failed to say how this would be achieved except, some voluntary pledges by the member states. 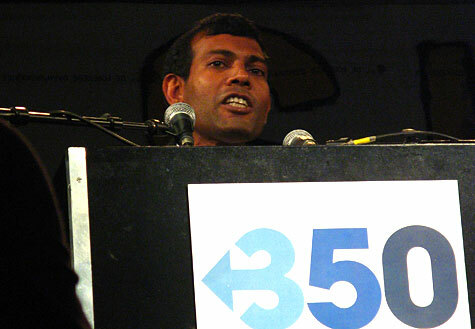 It was clear that a global temperature rise above 2 degrees and 450 ppm would be suicidal for the Maldives and other small islands states and Africa. The Maldives 350 Campaigns including 24 hours dive organized by Diving Association of Maldives (DAM) and Underwater Cabinet Meeting and even President Nasheed were campaigning well below 1.5 degrees. Well below 1.5 degrees relatively equates to 350 ppm. The Copenhagen accord contains no binding pledges and was not backed by the full UN meeting. As a result, it is up to individual states to voluntary decide whether they sign up to it. By 31 January 2010, countries are supposed to sign the Accord but couples of dozen countries have done so far. The accord does not set a date for when global emissions should peak, nor does it include any specific targets for cutting emissions that bind either developed or developing nations, nor international monitoring. It calls on developed countries to provide $30 billion a year between 2010 and 2012, rising to $100 billion a year by 2020 – how this would be raised and distributed only the God knows. When this money is divided among developing and vulnerable countries, an individual in these countries will receive less that 2.2 dollars.